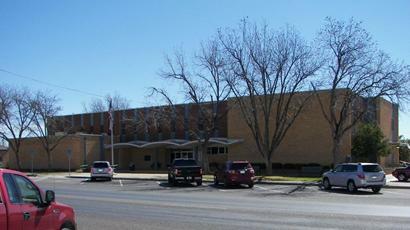 Crane County Courthouse, Crane, Texas. Although formed in 1887, the area of Crane County remained sparsely settled until an oil boom in 1926 brought in thousands of people the following year when Crane County was officially organized. Realtor O.C. Kinnison arrived in the area, opened an office and platted a townsite for Crane, naming the streets for his sons and daughters. 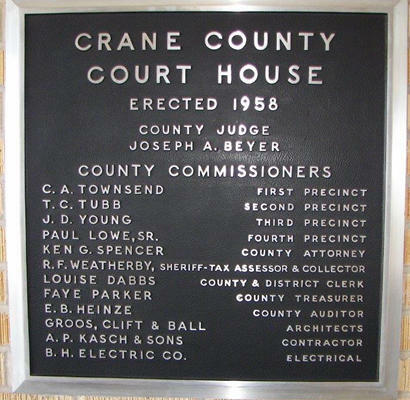 When the county was organized, Crane became the county seat. The county and county seat were named for Baptist preacher and one time president of Baylor University, William Carey Crane. Crane County was one of the last Texas counties organized and the county seat of Crane is the only community in the entire county. 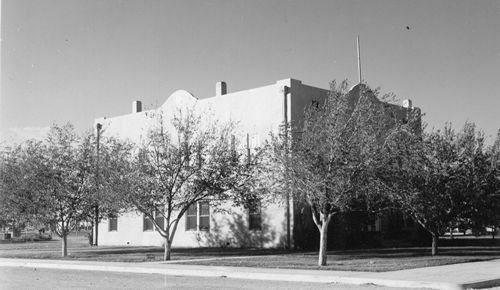 The county�s first courthouse, built in 1927, was a small, two-story Mission-style adobe building. 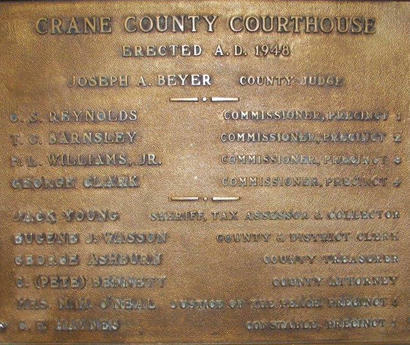 In 1948, the second courthouse was built. 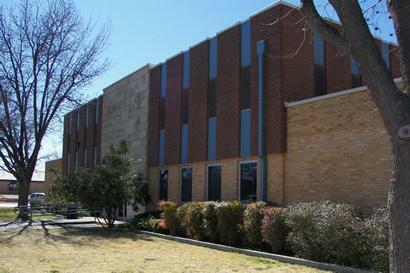 A much larger building, it was built of brick and concrete with a red tile roof in a modern Mediterranean style with a large central two-story section flanked by one story wings. 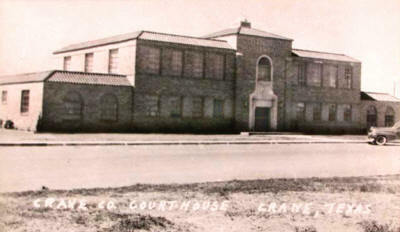 The 1927 courthouse was left on the property while the 1948 courthouse was being built and moved afterwards. 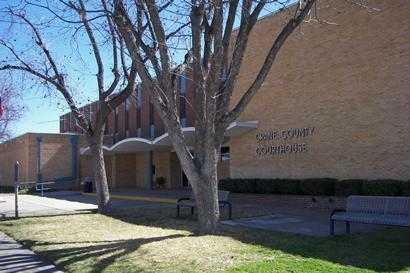 (During my first visit in 2006, the county judge told me that the 1927 courthouse was moved to the high school football field for use as a storage shed until it was burned down.) Within ten years, the 1948 courthouse was deemed too small and a large rear addition was constructed in 1958, designed by the architectural firm of Groos, Clift & Ball. The addition drastically changed the building�s appearance and in essence a new courthouse emerged with the former front entrance on the east side being moved to the north side. 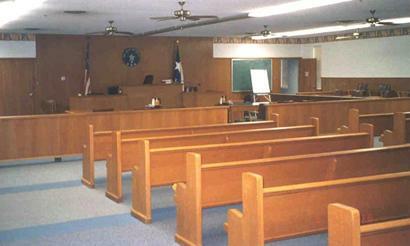 This courthouse continues to serve the county today. The east side entrance. This was the original front entrance to the building when it was constructed in 1948. Dedication plaque of the original 1948 building at the east entrance. Dedication plaque for the 1958 addition. 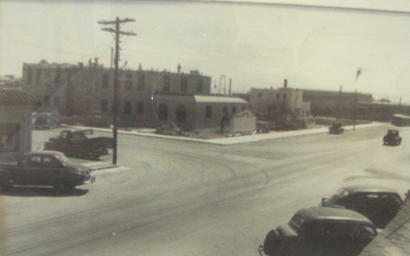 A display cabinet at the front entrance contains many historical photos, including this one showing the construction of the 1948 courthouse (L) with the 1927 courthouse (white building) to the right. Both county (formed from land that had once been Tom Green County) and city were named after Wm. 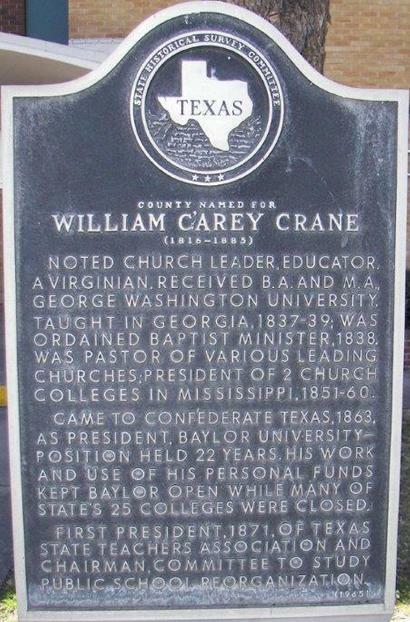 Carey Crane who was founder of the old Baylor University in Independence, Texas. Noted church leader, educator. A Virginian, received B.A. and M.A., George Washington University. Taught in Georgia, 1837 � 39; was ordained Baptist minister, 1838. Was pastor of various leading churches; president of two church colleges in Mississippi, 1851 � 60. Came to Confederate Texas, 1863, as president, Baylor University � position held 22 years. His work and use of his personal funds kept Baylor open while many of state�s 25 colleges were closed. First president, 1871, of Texas State Teachers Association and chairman, committee to study public school reorganization.